Apple announced iOS 8 at the keynote event of its annual Worldwide Developers Conference today. iOS 8 gets a multitude of new features for consumers, including revamped notification features, an upgrade to auto-correct called QuickType, support for third-party keyboards, improvements to Mail, and a new health tracking component called Health. Interactive notifications let users pull down notifications and interact with them to respond to text messages or other notifications without leaving the current open app, or complete actions from notifications shown on the lock screen. In a demo, Craig Federighi was able to reply to an iMessage and like a Facebook post directly from the on-screen notification, which popped over a separate app he was using. A new feature in the iOS keyboard called QuickType, adds predictive typing suggestions that adapt to the current context. QuickType learns each users habits and language while protecting privacy. Along with QuickType enhancing the existing iOS keyboards, Apple is going to allow users to install third-party keyboards for the first time, which means keyboards like Swype can be used natively on the operating system. Messages gets the ability to name conversation threads, add and remove people from group conversations, allow users to leave group conversations, a feature that has been much-requested by users. In addition to leaving a message thread, users also have the option to turn on "Do Not Disturb," which will mute message notifications from a noisy group message thread. With iOS 8, Messages allows users to share their locations right within the app. 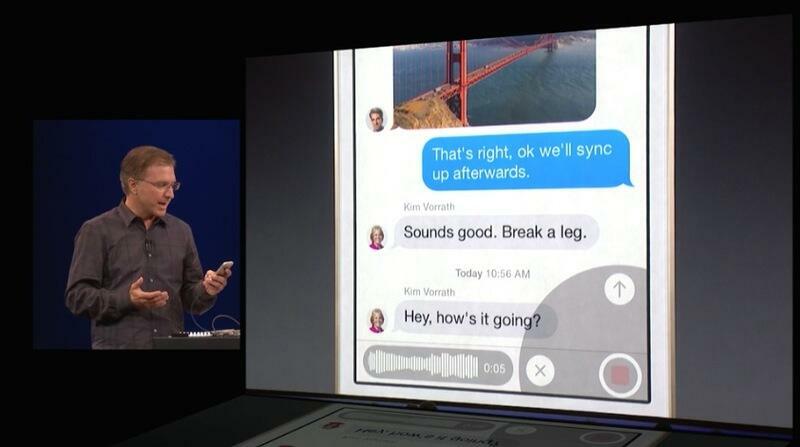 It also allows audio and video messages to be recorded directly in the Messages app and sent to friends. These messages can be viewed inline or via the lock screen. Craig Federighi showed off a neat trick with an audio message -- he held the phone up to his ear to reply, with the message automatically sending when he lowered the phone. HealthKit is a new developer API that will gather and consolidate users' health information from multiple sources and apps, such as those from Nike and Fitbit. A corresponding "Health" app will monitor fitness metrics, linking into third-party apps to gather data. Apple has been testing HealthKit with the Mayo Clinic, letting patients and doctors work together using HealthKit to get personalized thresholds for readings, notifying doctors automatically when something is wrong. HealthKit aims to bridge the gap between patients, doctors, and health-tracking devices. According to the Mayo Clinic, HealthKit has the potential to "revolutionize" how the health industry works. Siri gets several updates, with the ability to be invoked hands-free with the phrase "Hey, Siri" along with Shazam song recognition, 22 new dictation languages, streaming voice recognition to show users search results as they speak, and more. There are thousands of new APIs for developers, and one of the most exciting of those was Extensibility. 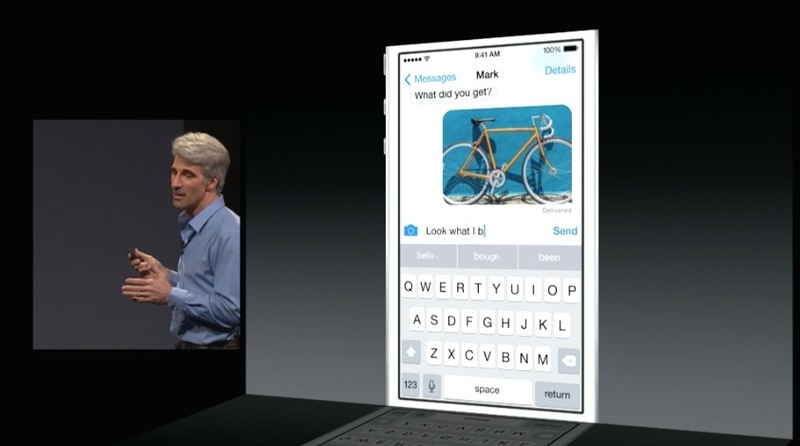 This feature allows apps within iOS 8 to share information with each other and with the Notification Center. Demoed on stage, Extensibility allowed filters from third-party apps to be used directly on pictures within the Photos app and it also brought Bing translation to Safari. Extensibility also allows apps to install widgets within the Notification Center, which work similar to existing Apple widgets for the Calendar, Stocks, and more. This was demoed with an ESPN SportsCenter widget, which allowed sports scores to be displayed automatically within Notification Center. Developers will also be able to access Touch ID for the first time to protect sensitive apps. Fingerprint data will be kept separate, but authentication will automatically unlock passwords stored in keychain to grant user access to apps. A Family Sharing feature will let families share photos, calendars, reminders, and more among up to six family members at once. Family Sharing also allows families (of up to 6 people) with Apple ID accounts using the same credit card to share apps and books. With Family Sharing enabled, when a child attempts to purchase an app, an adult will get a popup on their own device asking them to approve the purchase. iOS 8 will support most recent Apple iOS devices with the notable exception of the iPhone 4. iOS 8 will be available to developers as a beta today and it will be released to the public in the fall. MacRumors readers can discuss the upcoming iOS version in our new iOS 8 forum. Really? Underwhelmed? IMHO, this was one of the best Apple Keynotes in a long while. EXTENSIONS alone is a HUGE thing for iOS. Handoff for Yosemite is AMAZING. I'm still blown away by this Keynote. Absolutely phenomenal! I love my Apple products. I can do these features on my Android phone. Hey Galaxy or Hey Google. Messaging interaction without leaving the app I'm in, etc. I noticed you only mentioned the features that you can do on Android but conveniently forgot to mention all the things you can't do on Android. Apple has copy machines, too, apparently. Yet you chose to waste your time by trolling on an Apple Fan based website then. Sheesh. A couple big features came up that I nearly leaped in the air upon hearing them. The first was Messages and how you can now carry SMS over to your Mac. And the interactive notifications are definitely cool; both in the OS and on the lock screen. Every major update of iOS makes it less and less necessary to jailbreak. Which means Apple really is starting to acknowledge customer demand for features. My favorite quote from today's keynote was by Tim Cook: "I do read your emails!" Crazy buggy. Half the apps on my phone crash on launch, at least with an upgrade from iOS 7. Facebook is one notable culprit (instant crash). Definitely not ready for prime time yet. Well... duh. Of course it's not ready for prime time. That's why it's a developer beta, not a public beta.